Doctor Who: THE POWER OF THE DALEKS, Animated - Episode 3 Review | Warped Factor - Words in the Key of Geek. When Tony says run, run like a rabbit! If Episode 1 of this newly-animated but long-beloved story was mostly about the system shock of Patrick Troughton being the Doctor (or was he? ), and Episode 2 delivered the Daleks in all their crisp, alien glory and the perverse, growing certainty of their cunning, Episode 3 is the ‘balancing’ force – the humans are shown as factionalised, as they were long before the Daleks arrived, but the Daleks have become a wedge in the crack of their dissension, a fundamental issue over which the colony can be divided. Their surreptitious power-hunger and the way in which they play with the emotional weaknesses and hopes of the blind humans is the Sixties, science-fiction equivalent of House of Cards, in that you almost root for them, simply because they’re so brilliant and ruthlessly single-minded and the humans are so gullible and consumed with their own divisions. Meanwhile, despite the incredible ‘grab it and run’ performance Troughton delivers in the first episode of the story, it’s really here in Episode 3 that we really begin to understand that the world we’re in is not just one where this shorter, dark-haired man is playing the same character that William Hartnell played, but one in which the actual personality of the Doctor, just as much as his physiognomy, has fundamentally changed. Here’s a Doctor who throws things around the room just trying to get to the part he wants, who knocks up a bit of technical kit that can possibly render the Daleks powerless in half a scene, and involving quite a lot of hitting one thing with another, rather than, for instance, three episodes of Hartnellian mercury-gathering. The skills and personality of this new Doctor are a strong hook, but there’s a through-line of character too – Troughton’s exasperation at the greed and selfishness of the colonists in this episode could well have been written for Hartnell, giving us a consistency of Doctoring against which to balance the exciting new version that Troughton is giving us. In essence, it’s only in Episode 3 that we realise that that’s what is what’s happening here, that there are new and exciting ways in which the Troughton incarnation is going to differ completely from the Hartnell version. Nobody in the audience had really considered this was possible until The Power of the Daleks was broadcast, and it’s here in Episode 3 than the penny drops, making Troughton a very solid focus of our attention. That means that the power struggle compellingly eats up the run-time of this episode: the struggle between the new Doctor and the gradually re-animating Daleks (it’s in Episode 3 that we stop having just a single active representative of the species, as it steals the power to revivify its comrades); the struggle between the forces of authority and rebellion on Vulcan – and of course the undercutting of both by the forces of naked self-interest; and the struggle between the humans who still think they’re in charge of their own destiny and the Doctor, Ben and Polly, who threaten the Daleks. As an episode, this one balances all the forces, and then ramps all of them up by at least 20% in terms of open hostility. It’s gorgeous that one of the most shocking sequences in this episode is the original Dalek, the one who’s been telling everyone it’s their servant, simply reaching out and operating the controls that will divert power to its dormant fellows in the capsule, because there’s a sequence of all the power meters spiking off the charts when it does so. That’s the perfect metaphor to describe the tone and heartbeat of this episode – the Daleks, taking independent action, ramp up the energy, making everyone more and more edgy as the episode goes on. In terms of the animation, this is exactly what it claims to be – the middle of the story. Both of the first two episodes packed big punches, animationwise, and this is more a case of returning to the world to carry on watching – Vulcan, the Tardis crew, the Daleks, they’ve all been animated for us already, so there are fewer jaw-dropping moments in which the animation can shine, BUT fewer doesn’t mean none, and there are still moments here where the smoothness of the animation actively improves on the original. That scene of the Dalek stealing power is one – there’s a clarity and a crispness to it in this animated version that makes it chilling, like the action of a devil-child. The moment when the Doctor waggles a screwdriver and the Dalek gets a shock is another such moment – again, the clean quality of the animation means it looks believable, whereas in live action, as the audio of the confused Dalek suggests, it took them a little too far back to their humanoid range of emotion and helplessness. And, as in Episode 2, scenes of Dalek chanting have an altogether more effective, eerie quality in the animated version, especially following the reveal of the three re-animated Daleks coming down a ramp with far more smoothness than the original operators (with the best will in the world) could manage. What Episode 3 does is Nothing Wrong – it builds on the set-ups and the visual wow-factors of the first two episodes, and at no point throws you out of the story. If you think that’s meaningless, contrast it with the part-live action, part-animated stories, where the join always takes a little while to get over, to re-adjust your mindset to. In Power, because it’s fully (and lovingly) animated, Episode 3 can be and feel exactly like Episode 3 should – taking us further into a story which has already hooked us, acknowledging and identifying the reasons its done that, and turning up the heat. 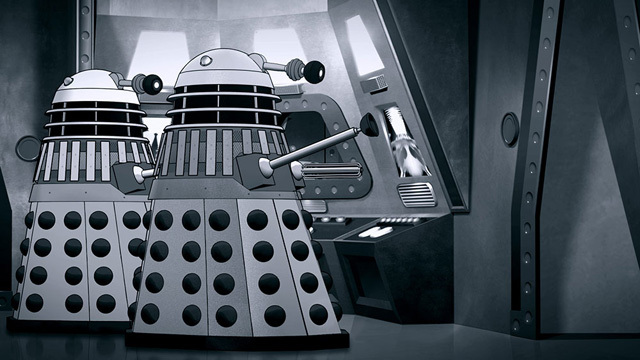 The Dalek chant of ‘We will get our power’ at the end, while arguably only put into the original to have a bit of Dalek chanting on which to end the episode, in the animated version seems to make rather more chilling sense – the power of the Daleks is increasing all the way through this episode, from a single defenceless servant, to three fully operating Daleks who’ve divided the colonists into active factions around themselves, and they end the episode chanting about the power that is yet to come to them.